It’s hard to tell what exactly Thumper is on first glance. Described by its developer, Drool, as a “Rhythm Violence Game,” thumper comes off like the unholy spawn of Rez, F-Zero and Amplitude. The game has you guiding a metallic beetle down a psychedelic track, flying at breakneck speeds as you twist and turn through obstacles and nodes to the thumping base of some harsh electronic beats. The game starts simple enough. My space-scarab slid up the track that went ever upwards as a low, tense ambient track took over for the duration of the game’s tutorial. The act of playing Thumper is simple. The d-pad moves your beetle from side to side, while the X button is your action button, letting you slide and jump depending on the context. With such simplistic controls, it can be easy to write the game off as an easy call-and-response type of rhythm game, but I found that to be far from the case. While barreling down the highway at top speeds, audio and visual cues help clue you in to oncoming obstacles, which include an indicator on the track that triggers a shock wave, to sharp turns in the track that require you to slide through or risk taking damage, and barriers to break through. As the demo progressed the game started to throw everything at me in rapid succession, which proved to a real challenge, albeit a rewarding one once you pull it off. The further I progressed, the more that simple ambient track evolved into a more intricate composition, complete with tempo shifts, dynamic swells and the like. As a result, the level and obstacles generated became more intricate and intense. 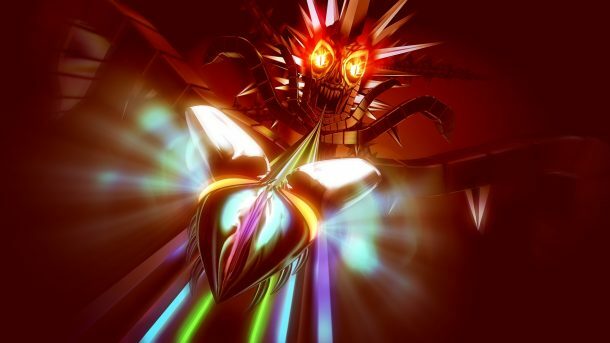 When I first played Thumper at E3 2015, I thought it was a cool game but I could see myself needing to consume it in small chunks due to the total sensory overload it provided, and that was when it was played on a TV. The inclusion of PlayStation VR took that experience and ran with it. It went from just being a bit overwhelming to making me sweat, raising my heartrate, and giving me an overall sense of dread and anxiety as I flew down the track. Some might read that and say “Nope! Not for me!” and that’s okay, but I’m a huge fan of that. If a game can make me feel something, that’s huge. Bringing something emotional to the table is one thing, but being able to draw out a physical, gut-wrenching response through the intensity and immersion of a rhythm game is outstanding, and not something I ever thought I would see, let alone something I wanted.